What is a dutch baby? 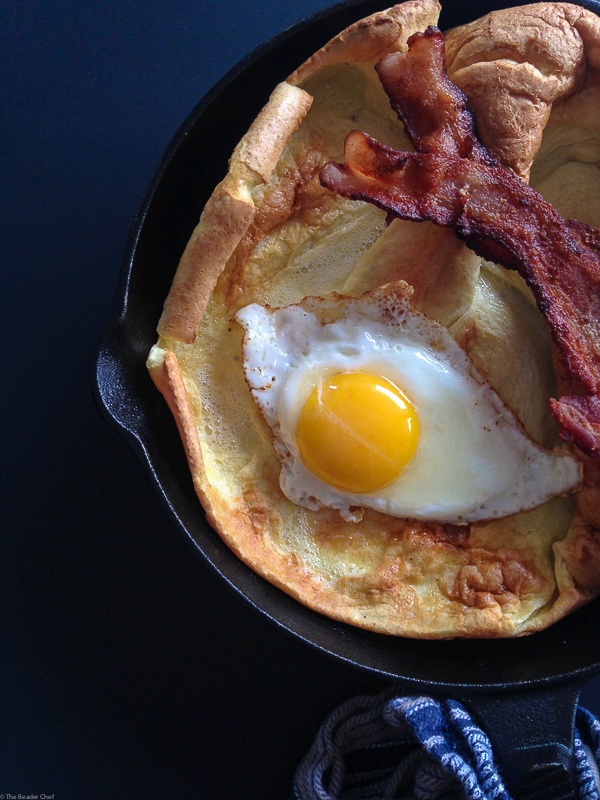 It’s a huge yorkshire pudding (popover) hiding itself as a pancake – for breakfast I like a savory dutch baby with eggs and bacon! Months ago I came across a couple recipes for making sweet and savory dutch babies and I thought to myself: “this needs to get up on the blog” – but I never got around to it and then in january (I think) a whole slew of them appeared on various websites and blogs. I had definitely missed the boat *insert tears here*. What this told me however, was that I should trust my instincts. Today my instincts told me that I need to share this recipe because the weekend is coming and readers may have a chance to make this yummy breakfast. So what is a dutch baby?! It’s a huge sweeter yorkshire pudding (or popover) hiding itself as a pancake that you can eat for breakfast… or lunch… or supper… or dessert. For breakfast, the recipe in this post, I usually make a savory dutch baby with a little less sugar, a little more salt, and fresh ground pepper – perfect for bacon and eggs. For lunch and supper, I’d essentially do the same, but maybe do a version with smoked salmon, red onions, capers and some sour cream or cream cheese (or both whipped into a sort of spread… gears are turning!). Dessert, you gotta omit the pepper, add some vanilla and sweeten it up a bit more, either in the batter itself or through it’s topping; I’m thinking powdered sugar dusted on top with some squirted lemon juice and candied lemon slices. 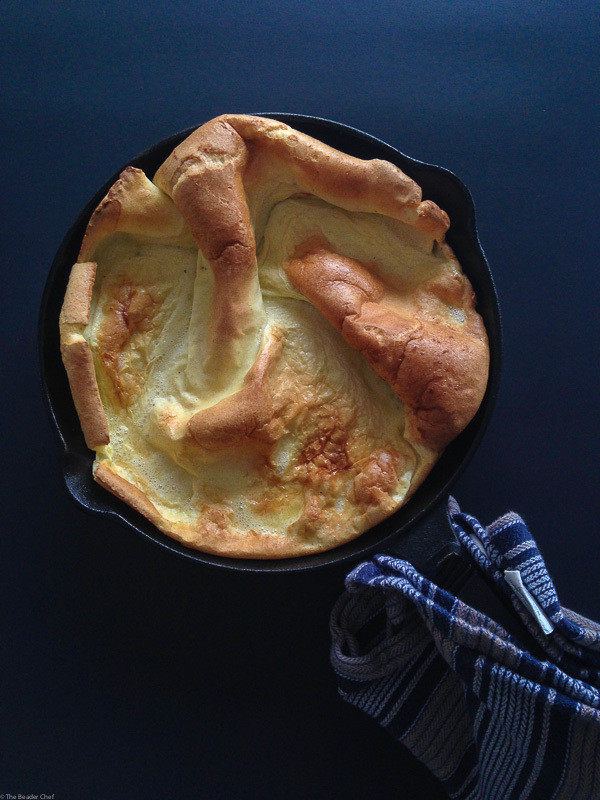 Really, dutch babies are so versatile! All that said, I really only have the savory dutch baby nailed. Expect a post with a sweet version coming soon… with those candied lemon slices of course! Also! How do you like the new look?! Let me know what you think in the read survey that popped up on the right lower side of your screen! In a large bowl, mix together the eggs and milk until well combined. Next, whisk in the flour, sugar, salt and pepper. Set aside for 30 minutes at room temperature. During this time, place a 10-inch cast iron skillet in the oven to get hot. Once the 30 minutes is almost over (about 5 minutes to go), take the pan out of the oven and melt the butter to coat the pan evenly. Return to oven to keep hot. When ready, take the pan out of the oven and quickly pour the batter into the pan and then return it to the oven. You will see the pancake puff up and turn golden, taking about 12 to 15 minutes to cook through. Once cooked serve with your favourite toppings. 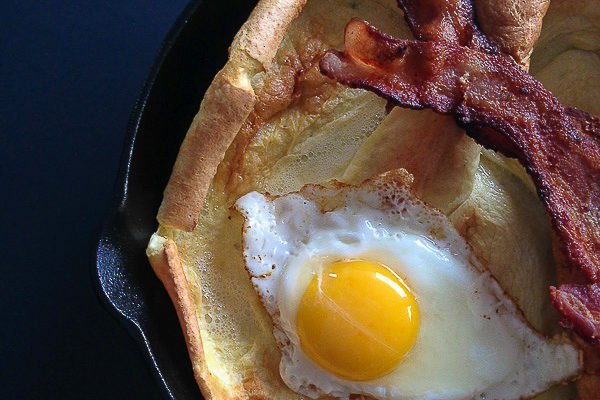 This dutch baby is perfect for breakfast with fried eggs and bacon!